The Westwood home at 2311 Parnell Ave., LA CA 90064 has returned to market in 2010 after previously being for sale at the end of 2009. 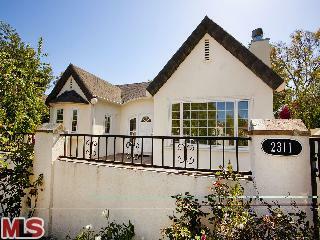 Currently, this is the least expensive house in Westwood not on Overland Ave. with an asking price of $849,900. According to the MLS, the home is a 3 bedroom / 2 bath, 1,216 sq ft of living space on a 6,075 sq ft lot. This house is on the smaller side for living space, so I think most people buying it would consider either adding on and reconfiguring the floor plan or just tearing it down and starting over. The condition inside is fair and could just be updated some and lived in if someone didn't mind the smaller public rooms. In either case, there is some nice potential here at this price point.